Do you have a class during lunch or dinner? Are you unable to make it to a meal because of a study session or practice? Would you like to have quiet time in your room to study? Meal to-go is made for these circumstances. 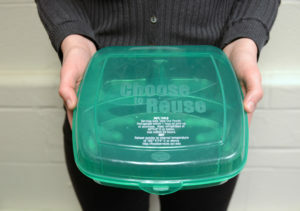 Every student with a meal plan is given a reusable, to-go container credit at the beginning of the school year. Use your to-go container whenever you want to take a meal to-go. Return it the next time you go to the dining center for a clean one. All meals to-go are deducted from the meal plan. • Students on a meal plan are eligible for one free meal-to-go container annually. • The first time you want a container for a meal-to-go, please ask our staff person at the dining center entrance. We will swipe your SUI.D. and give you a meal-to-go container. The swipe will debit your account indicating that you have been given your free container. • You may use the issued container to take a meal with you from any dining center. The issued container is the ONLY acceptable container allowed for a meal-to-go. • The next time you come back to any dining center, bring your to-go container. We will exchange it for a one that has been cleaned in our high powered, super-sanitizing washers or we can credit your account indicating that you returned the container and are eligible for another free one at another time. • If you lose your container, there will be a $3 charge to receive another one. • This program allows you the flexibility to eat on the run in order to meet the demands of your busy schedule.